Berkeley Unified is an inclusive school district. Most students with disabilities are included in general education classes for the majority of the day. Each school has at least one Education Specialist specializing in mild moderate disabilities and another Education Specialist specializing in moderate severe disabilities. John Muir also has a Deaf and Hard of Hearing Specialist. The special education program at John Muir is run by a team of diverse professionals, each providing services based on their own specialties. Visit John Muir Elementary School's Special Education Website to learn more. The dance program at John Muir Elementary School is based on the national and California standards for dance education. All students study dance each week. Each class performs during school assemblies at least once per year. And, each assembly highlights one of three main components of the program -- creative movement/choreography, contemporary dance and folk dance. The dance curriculum is designed so that each year builds on the year before. In choreography, children go from a simple idea of making dance, such as “start your dance when the music starts,” to the 5th grade assignment of choreographing a short piece for four people. This would include brainstorming and refining movement vocabulary, using concepts of dynamics and staging, selecting music, performing it for feedback from classmates and considering the title and costumes. The dance program is also integrated with John Muir’s academic curriculum. The garden at John Muir Elementary School is an inspirational, community effort to help children learn how to take care of the earth and to eat healthy food. Students, teachers, parents and community members all work together to keep the garden a vibrant and engaging place to learn at John Muir. Every student comes to garden class two times each month. They learn through directed, hands-on gardening experience, observation, songs, stories, artwork, and free exploration. Topics include planting, tending, harvesting, and tasting fruits and vegetables. We also learn about nutrition, seasonality, pest management, composting, animal husbandry and ecology. During class, students taste “ the harvest of the month,” which is seasonal fruits or vegetables. These same fruits and vegetables are also featured in the cafeteria and in cooking class. In this way we integrate and coordinate the curriculum with the goal of increasing the students’ exposure to healthy foods. If you visit a garden class, you might find a student excited about eating sour sorrel and dinosaur kale, looking closely at a ladybug larvae or feeding slugs and snails to the chickens. Garden class is a haven for exploration and discovery. All third grade students attend weekly music classes. The curriculum is based on Orff-Schulwerk methodology which includes singing, movement, rhythm, solfege, note reading, recorders and pitched percussion instruments. At the end of the school year, band and orchestra instruments are demonstrated in preparation for beginning instrumental music in fourth grade. After an extended period of sampling among violins, violas, ﬂutes, clarinets, trumpets, trombones, percussion, ukulele, guitar and chorus, fourth graders choose chorus or the instrument they wish to study. Fifth graders continue with chorus or the instrument studied in fourth grade. Classes are held twice a week during the school day. Both grades perform at school concerts. 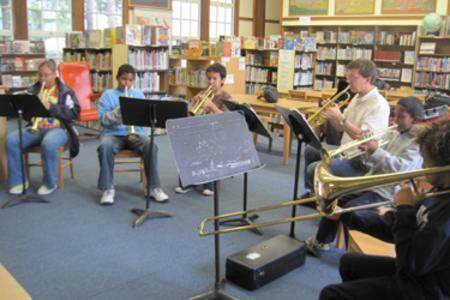 Click here to learn more about Berkeley Unified School District's Visual & Performing Arts program.